Q.Aneurysms are pretty scary things. Do they have any symptoms? Aneurysms are artery bulges. And, yes, they are scary because, if they burst, they are lethal. Many victims of a ruptured aneurysm die before they get to a hospital. The type and location of the aneurysm will determine the symptoms. Chest aortic aneurysms, which occur in the large blood vessel (aorta) that carries blood from the heart to other parts of the body, may cause shortness of breath, a raspy voice, backache or shoulder pain. Abdominal aortic aneurysms may cause pain or tenderness below your stomach, make you less hungry or give you an upset stomach. Cerebral aneurysms may produce headaches, pain in your neck and face, or trouble seeing and talking. Ventricular aneurysms in the heart’s main pumping chamber (the left ventricle) may cause shortness of breath, chest pain or an irregular heartbeat. If you have an aortic aneurysm, your doctor may prescribe medicines before surgery or instead of surgery. Medicines are used to lower blood pressure, relax blood vessels and lower the risk that the aneurysm will rupture. Beta blockers and calcium channel blockers are the medicines most commonly used. The standard treatment for aneurysm once it meets the indications for surgery is replacement of that weakened portion of the aorta with an artificial graft. Usually, a graft made from Dacron, a material that will not wear out, is used. In recent years, a treatment has been developed to repair an aneurysm using less-invasive surgery. In the procedure, a stent-graft made of a polyester tube inside a metal cylinder is inserted into the bloodstream at the end of a catheter. The stent-graft is positioned to carry the blood flow instead of the aneurysm. The following increase the risk of getting an aneurysm: being older than 60, plaque in the arteries (atherosclerosis), high blood pressure, smoking, injuries or infections of the blood vessels, a congenital abnormality, and inherited diseases. Most aneurysms are caused by a breakdown in the proteins that provide the structural strength to the wall of the aorta. These proteins can gradually deteriorate with age. But inflammation that is associated with atherosclerosis can accelerate this process. There are also naturally occurring enzymes that cause the breakdown of the proteins. An excess of these enzymes or other conditions that activate these enzymes may also contribute to the formation of an aneurysm, or its sudden growth. 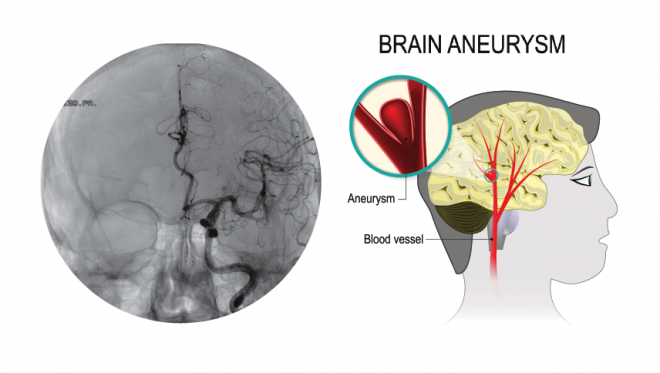 In rare cases an aneurysm may be caused by infection. The combination of early diagnosis with safer, simpler and ever more successful treatments can prevent needless deaths due to ruptured aneurysms. If you think you or one of your family members might have an aortic aneurysm, see a doctor without delay.